The fall in oil prices in the last 18 months is a large-scale international redistribution of income, from sellers to buyers. We have looked at the impact on some of the losers, the oil exporters. But what about the winners i.e. the oil importers? For some the price fall was a great relief. It was a huge drop. The price of crude oil is less than half what it was in June last year. A fall in the oil price is often seen as similar in its effects to a tax cut for consumers. It means they have more to spend on other goods and services, some of which will be produced by businesses in the same country. It also reduces costs for businesses that use oil products - which means any that have goods to transport, plus the petrochemical industry which makes plastics, fertilisers, synthetic fabrics and much more using raw material made from refined oil. It also helps any that spend a lot on the goods and services produced by these industries - farmers, for example. Take the eurozone. In the two years before the big price fall the region's economy contracted. Last year it grew and is doing so again this year, though admittedly not robustly. The fall in the oil price is not the only factor, but it surely helped. The UK has also seen stronger growth. Yes there is an oil industry which is being hit - more on that later. There were other factors, but the UK economy grew faster in 2014 and 2015 than it did in the previous years. The consultants PWC estimate that an oil price settling at about $50 a barrel for five years (it's now below that) would add about 1% to the British economy. Not huge but worth having. There are many other countries, which are net oil importers where the beneficial impact may have been masked by other developments. In China, the decline came at the same time as the economy's growth rate was slowing for other reasons - its previous breakneck pace of expansion was not sustainable indefinitely. Indeed the Chinese slowdown was probably one factor behind cheaper oil - though abundant supplies are generally thought to be the main element. It is possible that China's slowdown could have been even more turbulent had the economy not had some additional support from cheaper oil. Japan, meanwhile, is almost totally dependent on imported oil. The fall in the price was not enough to prevent the economy slipping back into recession in the second and third quarters of this year. Still, the Japanese economy is projected by the IMF to grow, weakly, for this year as a whole, having contracted in 2014. There's another benefit from cheaper oil. Many countries subsidise fuel. The International Energy Agency estimates that in 2014 global subsidies for fossil fuels were worth almost $500bn (£330bn). Of that, some $267bn went on fuels made from oil. Cheaper oil means that governments can cut subsidies while consumers pay unchanged prices, although that will eventually mean rising fuel prices for those users when the oil market starts to rebound. Already India, Egypt, Indonesia and others have taken the opportunity to reduce subsidies. That's the upside. But even for net oil importers there's a downside. Take the US. It is a net importer but the beneficial impact is not quite as pronounced as it would have been a decade ago. 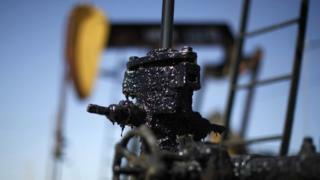 The reason: the rise of shale oil. It means that US dependence on foreign oil has declined markedly. In 2005 the US met 35% of its own crude oil needs. Last year the figure was 61%. The rise of shale oil means there is a larger chunk of the American economy that is vulnerable to the effects of cheaper oil. There are many countries that are net oil importers that have significant industries of their own: the UK in the North Sea, and Brazil and Indonesia, for example. In the UK, the industry has declined. The UK has been a net importer of crude oil since 2005 and of products made from it since 2013. When oil prices fall these governments do lose some tax revenue. But they are likely to see gains in taxes on incomes, consumer spending and non-oil business profits. In the case of the UK, PWC estimated the overall impact of the price fall will be more tax revenue in total. There's also something unusual about this episode of lower oil prices that creates a potential downside even for the many oil importers with little by way of their own oilfields. The background is one of very low general inflation in many countries, especially among the developed economies. In the UK, the eurozone, the US and Japan central banks have an inflation target of 2% and the headline rate is well below that. As long as it's just energy prices that are falling, it's not a major problem. But central bankers are wary of what they call second round effects - if prices and pay agreements start to reflect an expectation that inflation is going to be be very low or even below zero. That can lead to a damaging spiral of falling prices or deflation. There's a risk that consumers and businesses will delay spending to take advantage of lower prices and it can aggravate debt problems. Inflation above zero but still very low can have a similar effect. It's not generally thought that there is any imminent danger of the UK, the eurozone or the US experiencing that problem. But the central banks are very keen to ensure that they don't. For the most part then cheaper oil is a benefit in most countries. But some - the oil exporters - are exceptions to that rule. And for the rest there can be some less appealing side effects that warrant careful scrutiny.